In the modern vernacular to refer to something or someone as a sacred or holy cow, is to state that what is spoken of is undisputed in its authority, it takes on the features of a monist God. Usually this term is used about a person considered to be in a position of untouchable power or an organization that makes common man helpless if he wishes to agitate against it. Confronted with sacred cows we find that in their field of authority grows paranoia, fear, brutality both within the cow itself as much as without. It is a form of symmetry at play here that leads to games of secrecy, espionage and leaking of information from within the sacred cow and from without feelings of oppression and theories of conspiracy that gives the sacred cow even more of the often illusory power it holds. The sacred cow can be about people in powerful positions, about organizations considered to be powerful – but the sacred cows can also touch the kingdom of Self and Ego. The most frequent statement of the sacred cows within the confinements of one’s own ego lain fortress is when we define our helplessness or our vices by referring to parts of the picture invested with an enormous importance. For instance, ‘because of my upbringing’, ‘because of the violence I suffered’, ‘because I was misunderstood’, ‘because my bipolar condition…, ‘because my star sign says…’ There is fatalism at play here in our fortress of ego which we guard very well. In fact it is more important for the human organism to be consistent that to be good. We are constantly searching for affirmation of the self concept we are holding. Any attempt of defying it will be met with resistance conscientious or not. This is why it is at times so hard to convince a good person falling victim for negative patterns, about the predominant and forgotten goodness within. The explanation for the negative self concept has turned into a sacred cow. 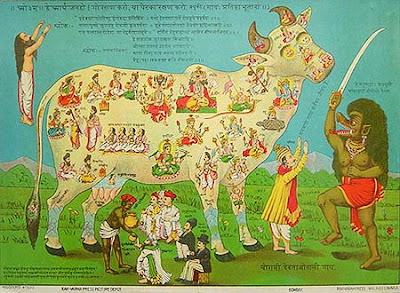 The origin of the sacred cow is found in cultures all over the world, ranging from the Moloch and the bull gods of Egypt to the primordial cow Audhumla in Scandinavia, but the term as in daily usage is from Hinduism, considering cattle as sacred and seen as a symbol of the mutual benefit and harmony between man and cattle. Now, the mentality around the sacred in traditional cultures is quite different from what happened with the use of the term sacred cow in the disenchanted western world where it got invested with a negative aura. At times we want to poke the sacred cow, but fear stops us from poking and questioning. If we do question the sacred cow if is either done in secrecy or by raving madmen roaming under a full moon in rays of conspiracy. It is that energetic current of the sacred cow that threw lasso around us and under the influence of these negative rays we become mirrors of vile rage. But there is a better way; it is to analyze the cow calmly – because, sacred or not, a cow is still a cow- and it is here in stating the fact our analysis perhaps should start. By understanding this we can treat the cow in a more harmonious way and we will try to understand what makes the cow sacred. If we calm our soul we will allow the curiosity of the mind to make passing judgments and form fluid opinions about the cow. Our knowledge about the cow will increase and mature as our horizon of understanding grows – because knowledge is the greatest weapon against fear and ignorance. Sacred cows are everywhere also in the contemporary occult world where some order, some personage or some book demands to be treated as a sacred cow – or ‘as it was gospel’. And this goes both ways, both for the ones receiving the gospel – and the ones giving the gospel. It is a negative reference acting out here in a ‘Deluzian repetition’. The way we are generating sacred cows follows a model similar to stating that one specific tree in the forest is more powerful and important than the other trees. This is to say that one’s own tree of adoration is the only tree, while the rest is less important bushes and weed. Certainly we have trees more noble, more royal, more poisonous and so forth – but in this recognition it should also be allowed to pass judgments of a personal nature – which is often a reference to taste or philosophical harmony - and also question the nature of the tree as any exegesis on a gospel is allowed to do. If a fruit is bitter and bad it must be allowed to investigate soil and climate to make inference about a possible cause. It must be allowed to dislike some fruits and feel indifferent with some trees in the world. If we start to obsess with why one tree insists on being the king of trees – or being the only tree – we are throwing our silver coins at the gallows of a thousand negative nights. It is not worth it. We are unique in our constitution – and we can at all stations on the track choose the explanations we want – but I feel it is important to always question, always be curious, not because we seek to condemn or break the subject for our curiosity – but in order to understand. After all, philosophy, the art of thinking and reflecting, started out with questioning what is truth – and this should be the pilgrims lantern at all times in this never-ending journey on the path of truth. Truth is not a sacred cow, it is not a gospel, it is not a man or woman of power or presence – it is that silence that kindles the fire in your heart and makes you move on with a smile playing over your lips – one content step closer to the source.